Ah …. ministry in Scotland. 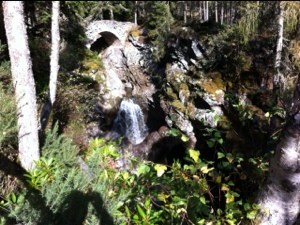 This is the Falls of Bruar today on a beautiful autumn afternoon. And yesterday as a group of clergy we spent the day considering vocation – revisiting the fires of vocation which brought to to where we are – considering the ways in which ministry has changed for us. We discussed with our Provincial Director of Ordinands the way in which our church is attempting to bring a new focus to full time training for a younger group of ‘whole of life’ clergy – the kind of people who will do the thinking about where our church is going – the kind of group from whom future leadership may come. I find it hard to work out how I have – if I have – negotiated the changes myself. My reflection is that I was ordained to be a visiting machine in a community not yet secular. Indeed the sectarianism both latent and overt of Northern Ireland in the ’70’s ensured that secularisation was kept at bay. In that sense, apart from the pain of the violence and the challenge of reconciliation, ministry did not have to be thought out as it does today. The one thing which provides and sustains all ‘three strands’ is knowing the redeeming love of our heavenly Father, especially as he has expressed that in the life, death and resurrection of his Son. Apart from the life, the new creation, that the cross brings we are only playing at priesthood.